Bottle-to-bottle recycling is a closed-loop process that conserves landfill space and energy usage by turning used plastic bottles into plastic resin for new bottles. When a leading recycling company realized it could run its plant more efficiently by closing some gaps in its operations, it chose to work with a group of highly skilled integrators to develop a solution based on Ignition HMI / SCADA software. CarbonLITE Industries operates one of the world’s largest bottle-to-bottle polyethylene terephthalate (PET) recycling plants, which is located in Riverside, Calif. The 220,000-square-foot plant recycles more than two billion plastic bottles annually using a six-stage process. Half-ton bales of bottles are decompressed into single bottles which are washed in caustic water, sorted, and ground into flakes. The flakes are thoroughly washed, rinsed, dried, decontaminated and then melted down into pellets, which are packed and shipped to bottle manufacturers and other customers. When the CarbonLITE plant opened in 2011, it did not have a SCADA system installed. There are about a dozen separate operator interface terminals (OITs) on the plant floor, and each one was running a different type of HMI software by a different vendor. The OITs only displayed their local processes and did not connect with each other. Information was not visible or accessible to most plant workers, so when a worker would need to find out what was happening in another area of the plant, they would have to use a radio or walk there, which is very impractical in a facility with a square footage nearly equivalent to four football fields. CarbonLITE solved this problem by taking the software that was running in one area and spreading it across the plant to unite all of its different systems. A worldwide system integrator called Trimax Systems had used Ignition to develop automation controls for thefront-end conveyor system and remote control handling system while the plant was under construction. In 2012, Trimax convinced the company to use Ignition for the entire plant. 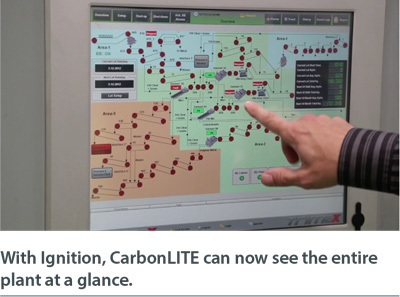 Although a number of other software vendors tried to convince CarbonLITE to use their products for the whole plant, the company ultimately chose Ignition because of its functionality and cost. Some at Trimax who were involved with the project believe that their relationship with the recycler was also a factor. Trimax used the Ignition Works package to combine all of the stations, PLCs, devices and proprietary systems in the plant under one software solution. This has provided visibility to vital information across the company, enabled the many systems on the plant floor to communicate and work together, and empowered the staff with greater ability to run processes efficiently. According to Bryan Riley, Trimax Systems’ lead engineer on the CarbonLITE project, the biggest part of the job was “combining everything into a unified system, so that they can look at the entire plant from multiple locations.” Now, operators can view information for the whole plant from any computer on the network with Java. This gives the operators the ability to see where any problems are located and troubleshoot them. With the Ignition Mobile Module, the system can also be accessed on smartphones and tablets. “It becomes a very powerful tool. The maintenance mechanics and the operators and everybody can walk around the plant floor with real live data on them at all times,” said Riley. Ignition also provides remote visibility which allows the corporate office to look at its process and get numbers, trends and reports directly. In comparison to other SCADA software packages, Ignition allows companies to put many users on its license without causing explosive increases in cost. “One of the nice things about this system is that it comes with unlimited licensing from your server, whereas with other SCADA packages you have licenses for the number of seats. So you not only have to buy the development package and the runtime package, but you also have to purchase runtime packages for each one of the systems that will be running the SCADA software. It could run up into the tens of thousands or hundreds of thousands of dollars, depending on how big the SCADA system is,” says Bob Kimmel, an engineer for Trimax Systems, explaining how most SCADA software is licensed. Ignition also saves money by providing an extensive number of default drivers that are not typically included with other SCADA software and which can be overly complicated to set up. The results of the project were excellent for both CarbonLITE and Trimax, and CarbonLITE is pleased with the new functionality, according to the former director of operations for Trimax. The Trimax team was able to complete the project at a very low cost because it consisted of a single work system that contains many tags and screens within it. Trimax considers Ignition its software of choice. Riley says that Ignition gives them “all of the tools that we want and we need, and the tools that make our lives better without adding the extra complications that don’t need to be there.” For example, Riley made templates that he used repeatedly for the project. “The amount of time it saves in programming is just fantastic compared to other HMI systems,” he says. Trimax can even set up new connections remotely without having to come to the site.